The Children’s Organ Transplant Association is an organization to which we have guided many of our donors over the last several years. Last week, they provided us with a beautiful holiday story about one of the children that donor funds helped. In the spirit of the season, I thought it appropriate to share here. During a season filled with lists and wishes, the holiday gift one Utah couple hopes for is one often taken for granted: a healthy family. For this family, one wish has already been granted. Now they wait for the ultimate gift … the gift of life. Last November, Brian and Emily Hoopes received a precious gift in the form of a long-awaited adoption. Their story began on Halloween 2008 when Baby Patrick was born in Michigan. The young Salt Lake City area couple adopted Patrick when he was just one-week-old, bringing him home to Utah a month later. 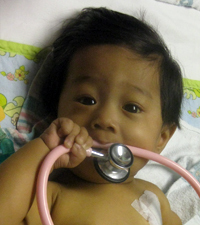 From the outset of the adoption process, Brian and Emily knew Patrick was a very sick infant. They were told the baby only had a few centimeters of small intestine and until he could get an intestinal transplant, Patrick would require constant medical attention. “Beyond knowing he would need lots of medical care we also knew Patrick’s life had been a series of miracles up until that point. We hoped those miracles would continue and we decided to forge ahead with hope, despite an uncertain future,” said Emily. Knowing the road ahead would be rocky given Patrick’s diagnosis of short gut syndrome, Brian and Emily joyfully initiated the adoption process and returned to Utah to their large network of family, neighbors and church friends. Their network of acquaintances expanded rapidly to include Patrick’s medical team of gastroenterologists, surgeons, nurses, pharmacists, dieticians, developmental specialists and many more medical professionals. This couple’s dedication and commitment to a tiny infant remained unwavering even as they discovered the harsh realities that laid ahead for each of them. The specialists at Primary Children’s Hospital in Salt Lake City, Utah, told Emily and Brian they would need to go to Seattle Children’s Hospital, an 840-mile trip, to further investigate the possibility of a life-saving small bowel transplant. They made their first trip to Seattle in early 2009. That trip was successful and Patrick was listed for a small bowel transplant. That’s when the waiting began. Just to maintain Patrick’s health while he waits for his transplant, the Hoopes’ pay co-pays for every doctor and therapist visit, and for every trip to the hospital emergency department in Salt Lake City. Sometimes Patrick is in the doctor’s office more than once each week. There are also co-pays for his medications; deductibles, and the costs of living at a hospital for a week or more at a time. According to Emily and Brian, the Hoopes family has had to tighten their belt because Emily’s current full-time job is taking care of Patrick. Intestinal transplants are a fairly new procedure. With Patrick being listed for transplant at Seattle Children’s, Emily and Patrick need to travel to Seattle every three months for evaluations. Each visit involves airfare and food and lodging for at least a couple days. They also pay charges associated with seeing doctors outside of their insurance network. When the transplant call does come and they need to get to Seattle quickly, Emily and Brian may need to charter a $10,000 flight to get Patrick to the hospital within the narrow time frame allowed by the surgical team. It became very apparent, very quickly, that Brian and Emily Hoopes needed help. Even though the Hoopes’ have health insurance coverage, they soon realized that regardless of how ‘good’ their insurance is, they are facing a huge financial burden — in addition to the stress of Patrick’s medical care they face on a daily basis. In the midst of these difficult days, Brian and Emily heard about the Children’s Organ Transplant Association (COTA). “With the amazing assistance that COTA provided, we were able to pull together a group of friends and family who are working together to raise funds for transplant-related expenses, and to raise awareness of the transplant journey our family was facing,” said Emily. Almost immediately, Emily became a regular contributor to Patrick’s website journal at www.COTAforPatrickH.com. And, just as quickly, bloggers got online and started reading, and responding to, this mother’s riveting words of gratitude and hope. After Patrick’s transplant, he and Emily will need to stay near the hospital in Seattle for about six months. This family will split Brian’s income across two households in two states. Undoubtedly, their out-of-pocket insurance costs will skyrocket and they will have co-pays for bi-weekly biopsies; for anti-rejection medications, and for IV nutrition, feeding therapy and home nursing. “When I consider the price of Patrick’s transplant journey, it is overwhelming. However, COTA has given us hope, making it seem that one more miracle is possible,” said Emily. The Hoopes family is getting ready for the holidays. They are grateful for the ongoing support their COTA team continues to provide; they are grateful for their COTA website Journal readers and Guestbook visitors, and mostly, they are grateful for the selfless gift an anonymous family will soon give to Patrick … the gift of life. Truly the best holiday gift that can be given. Last fall, it was easy to get bogged down and think that the brink of economic disaster was upon us. At the same time, it was easy to become jaded as story after story ran about companies and people serving their own self interests, which helped spiral into one of the worst economic recessions in world history. Nine months later, there are glimmers of hope – Standard and Poor reported today that the housing market might be showing the first signs of coming back, stocks have stabilized and the job losses have slowed some. What gives me the most hope, however, is realizing that humanity is still alive – that we as people aren’t letting the economic times get us down, but rather are reaching out to lend a hand to others. Earlier this week, The Corporation for National and Community Service issued a report on the state of volunteerism throughout the U.S. in 2008. Last year, 61.8 million Americans donated 8 billion hours of service to organizations, neighborhood causes and community action groups, up 1 million from the prior year. What is most startling – and exciting - however, is the number of people who joined together to solve community problems in less formal ways. Last year saw a more than 30% increase in the number of people joining with neighbors and community members to solve local problems – at a time when many were likely on less-than-solid economic footing themselves. It is inspiring to hear, it is even more inspiring to see. We are lucky to be based in the state that had the highest rate of volunteerism among every state in the nation – 43.5% of residents donated their time in some fashion to a cause or community endeavor. More than a third of the population of Salt Lake City were actively engaged in volunteer work in 2008 – the third highest rate among large cities. The spirit of people helping people is contageous, and we’re grateful to be based in a community that is so committed to helping others. Another thing that inspired me as I read this week’s report was the increase in the number of teens and college-aged youth who are volunteering – kids giving back to communities that have raised and nurtured them as they begin life on their own. These survey results and others indicate that the millenial generation really means it when they say they want to see change – they are willing to roll up their sleeves and work alongside everyone else to make an impact in their corners of the world. With the economy and traditional nonprofit funding sources still on shaky ground, nonprofit organizations are more dependant than ever on people giving of their time – helping keep operations and programming viable as charities shore up reserves and work to help an fill an ever-increasing need. I have been involved in a number of community organizations over the years – from literacy to helping the blind to youth programming – and my life has been richy blessed as a result. I issue a challenge to all of our readers and supporters to take a few hours of time out of your day this summer and volunteer – in your neighborhood, your community or for an organization that could use your help. Besides the warm fuzzies and feeling of accomplishment you get, it is also a great way to network, meet others and become more aware of what difference you can make as a single person. Let’s make August a month of giving back – in gratitude and appreciation for everything we have.